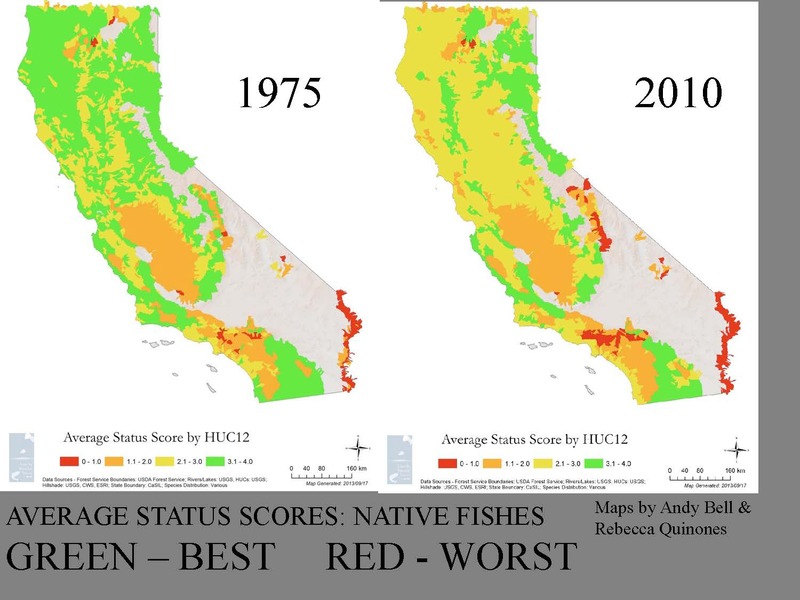 The 2014 California Water Policy Seminar Series, presented by the UC Davis Center for Watershed Sciences and the law school’s California Environmental Law & Policy Center, focused on the concept of ‘reconciliation ecology’, an emerging discipline that is based on the premise that traditional conservation strategies of designating nature reserves and restoration projects will not afford enough protection to present large-scale extinction, and so proposes that human landscapes and ecosystems be reengineered to accommodate both people and wildlife. 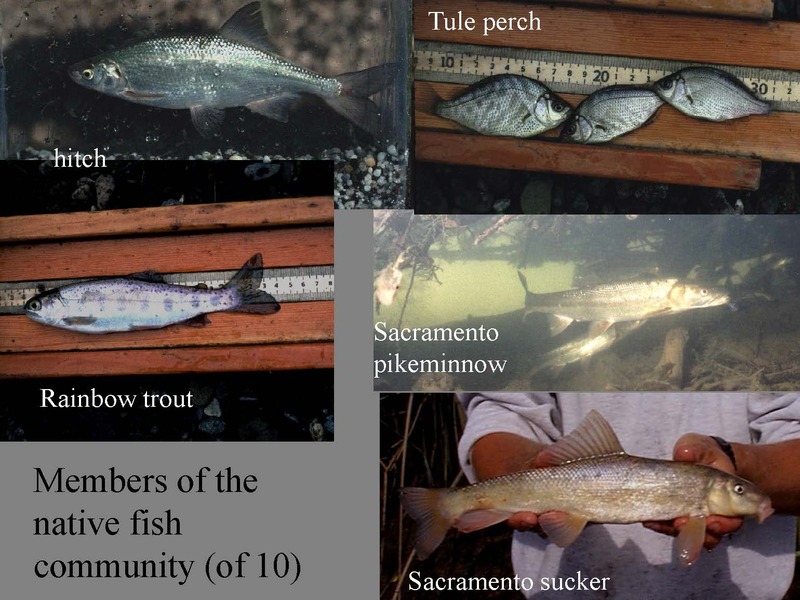 In this speech, the second in the series, Peter Moyle, Professor and former Chair of UC Davis Department of Wildlife, Fish and Conservation Biology, and Melanie Truan, Post Doctorate Researcher with the UC Davis Museum of Wildlife and Conservation Biology, discuss how a local creek with a long history of abuse went from trashed to local treasure, becoming a hotbed of biodiversity in the process. 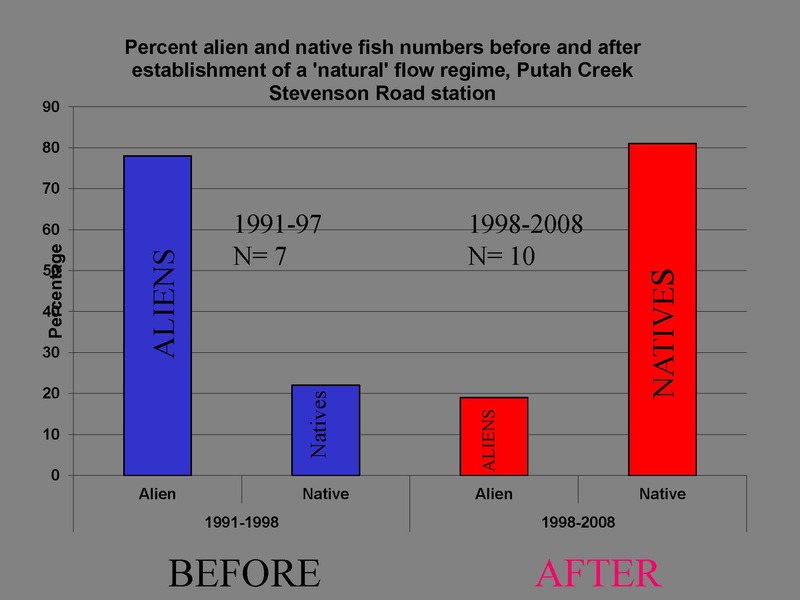 Is this success story that could be emulated elsewhere? 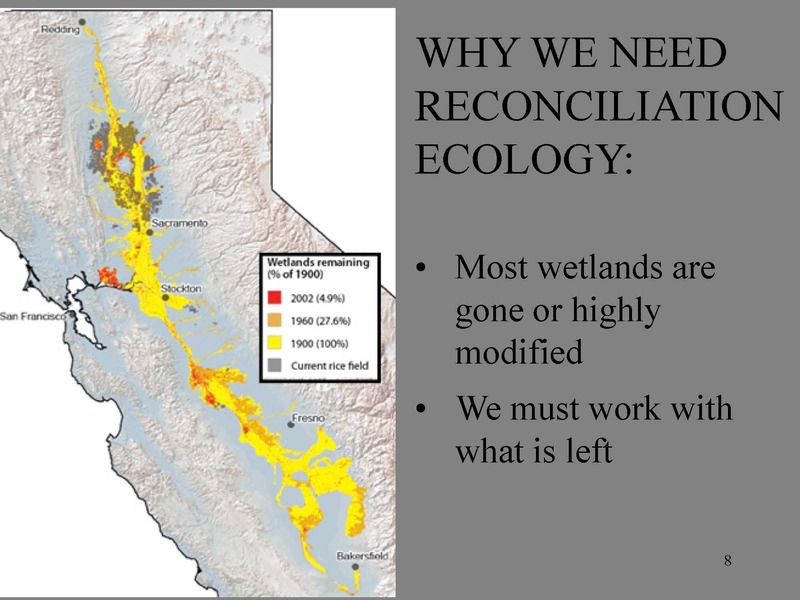 Peter Moyle began by saying he would be talking about a favorite subject, Putah Creek, and relate reconciliation ecology to what’s going on there. 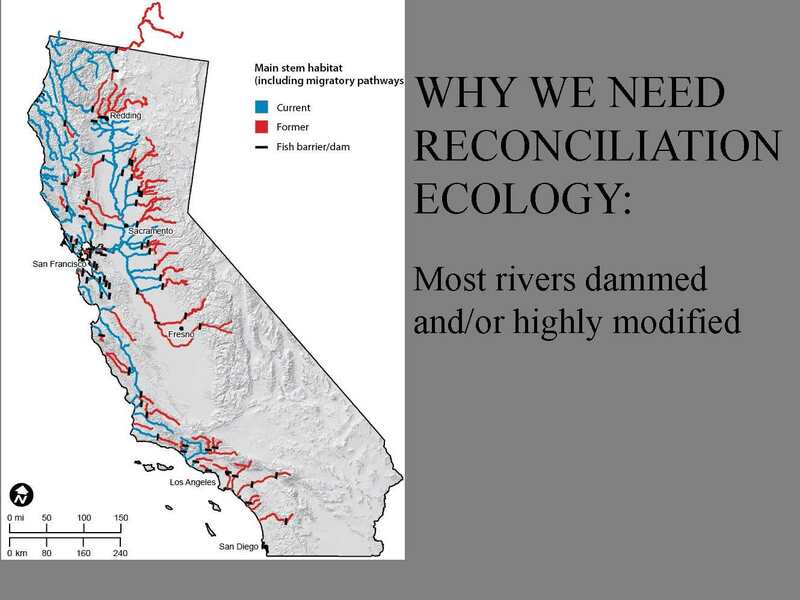 “The most interesting part of this is how Putah Creek became reconciled, and what makes reconciliation ecology work for it is why it’s such a special place,” he said. 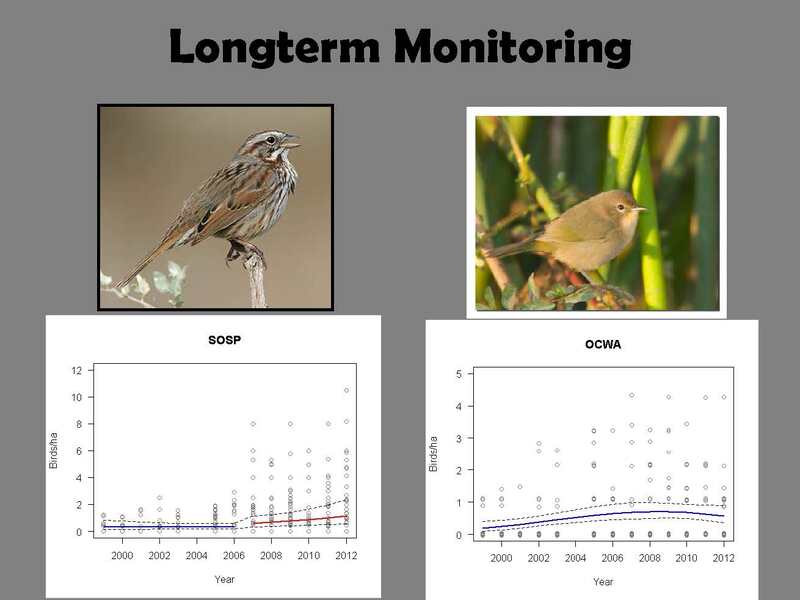 We’re constantly trying to manage from crisis to crisis and we’re not doing so well in that regard right now, said Mr. Moyle. 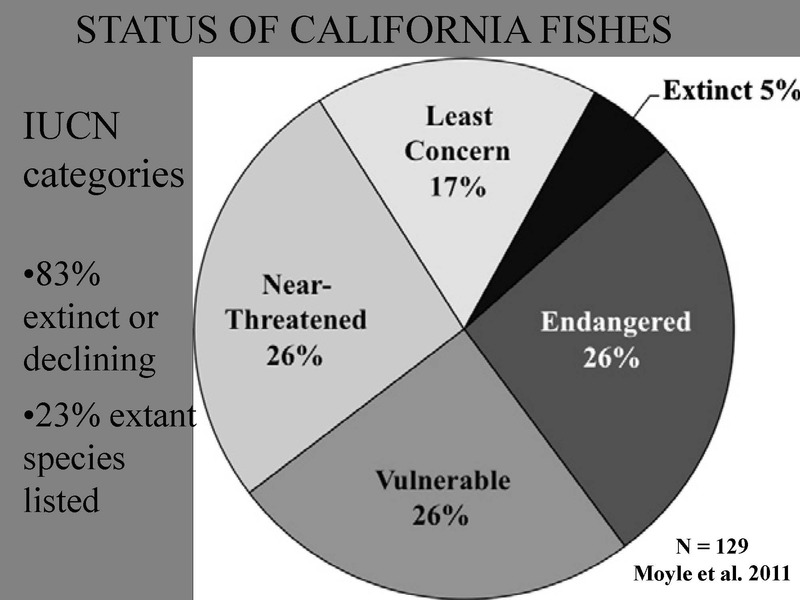 He then presented a pie chart that depicted the status of California fishes, pointing out that 26% of endangered, and overall, 83% of the 129 species are extinct or declining. 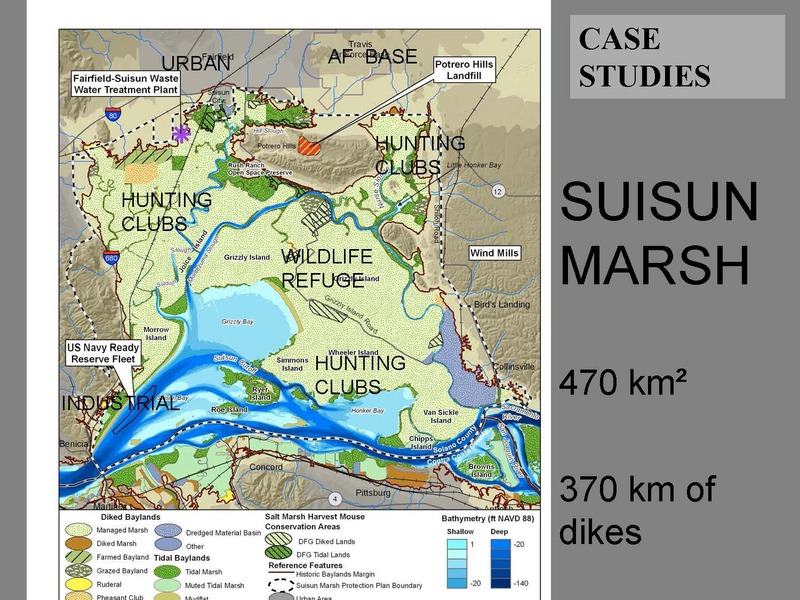 “Suisun Marsh is the largest brackish water marsh on the West Coast and it has some appearances of being a natural system,” he said. 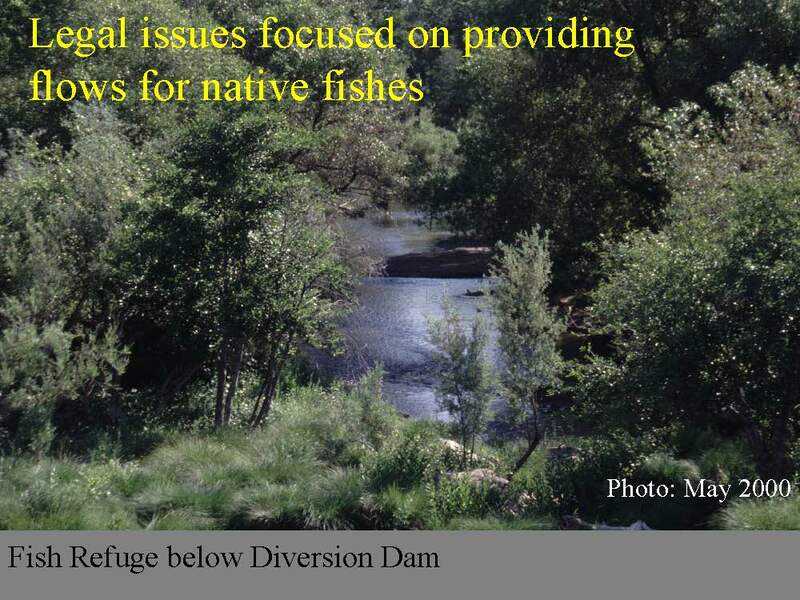 “But you only have to start looking out for dikes and things, you realize it’s not,” said Mr. Moyle. 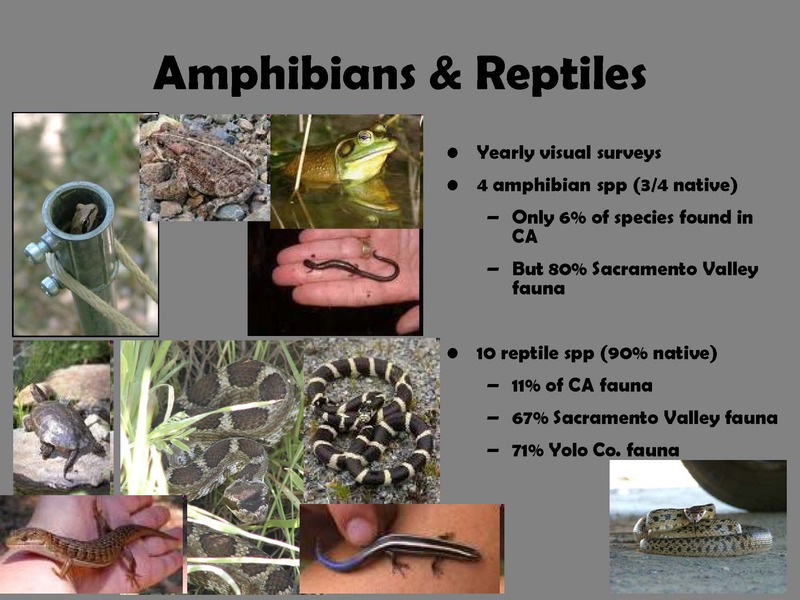 There’s a pretty diverse fish fauna in Suisun Marsh, and they all get along pretty well, he said, presenting a slide of the 15 most abundant fish species in the marsh. 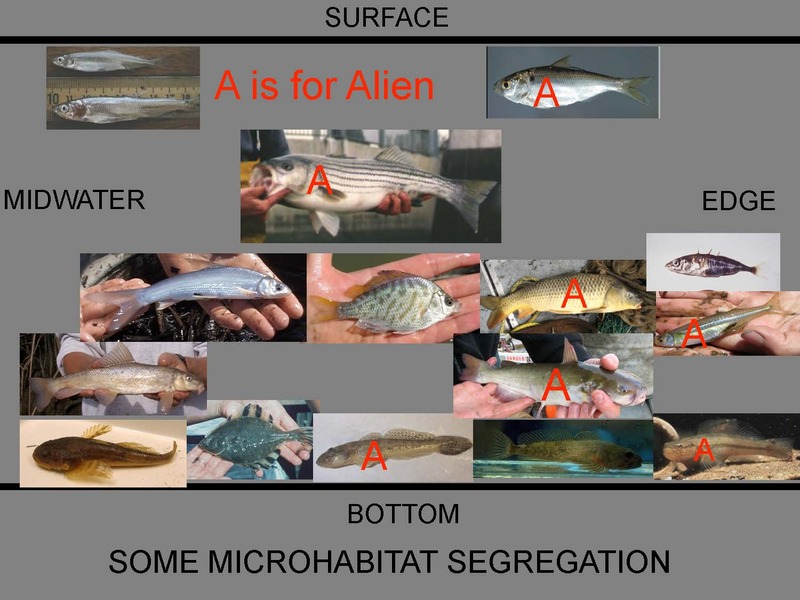 “These fish show a high degree of segregation and are behaving like a natural system, but everything marked A is an alien species,” he said. 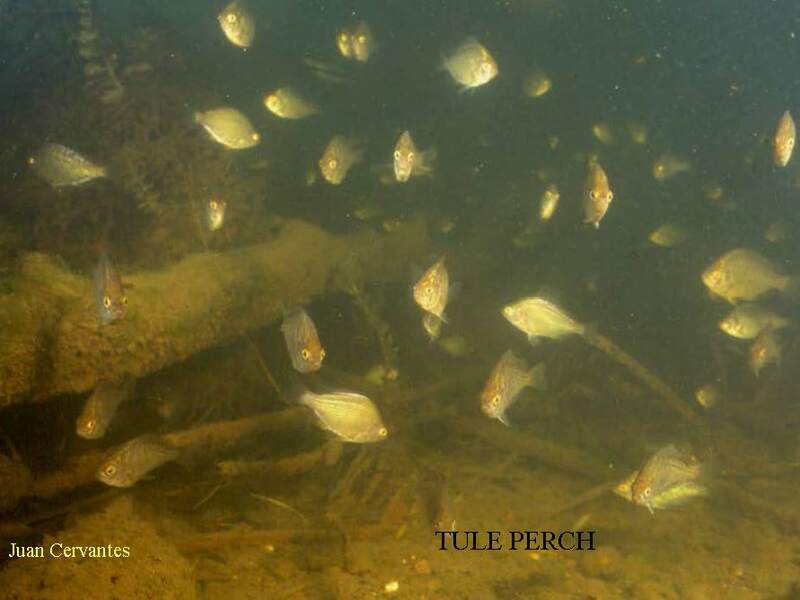 “Half the fish in the marsh are non-natives and yet, they are interacting with the native species. 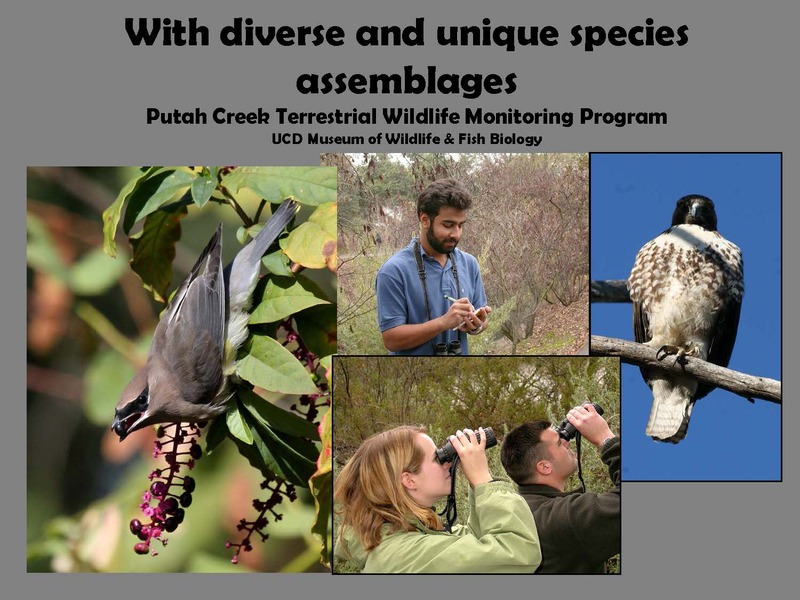 Melanie Truan then took the floor to discuss the wildlife, flora and fauna of Lower Putah Creek. 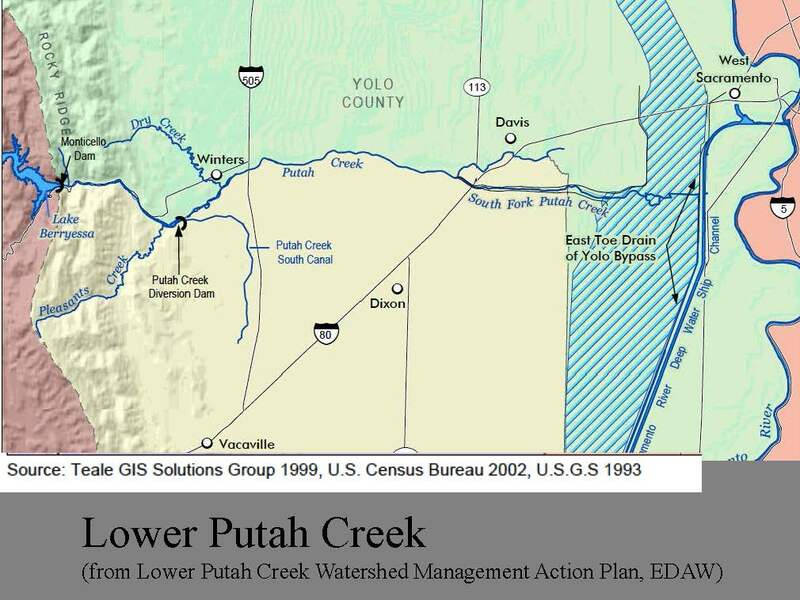 She noted that Putah Creek does continue above Monticello Dam and into the Coast Ranges, but the portion she would be speaking about is a 30-kilometer riparian remnant of Lower Putah Creek. 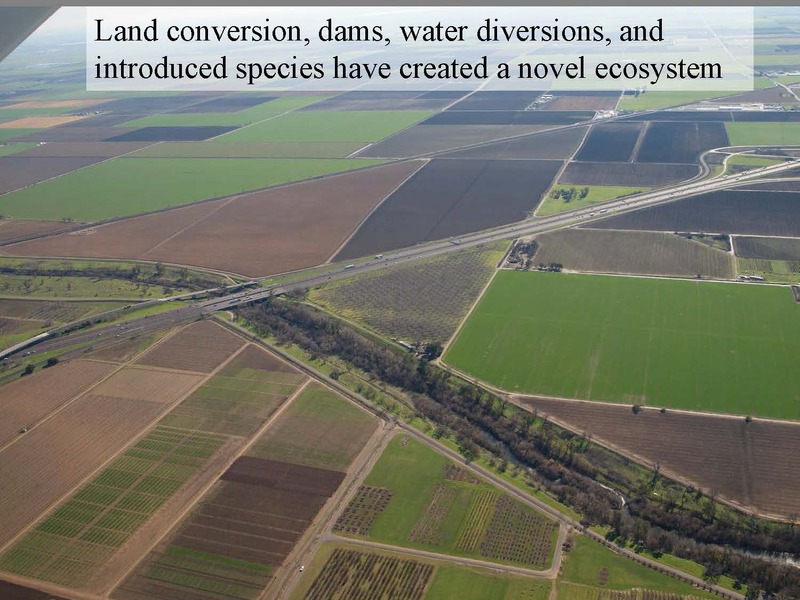 “It is a novel ecosystem with a lot of the new assemblages, and we’re hoping it can be a model for reconciled ecosystems elsewhere,” she said. 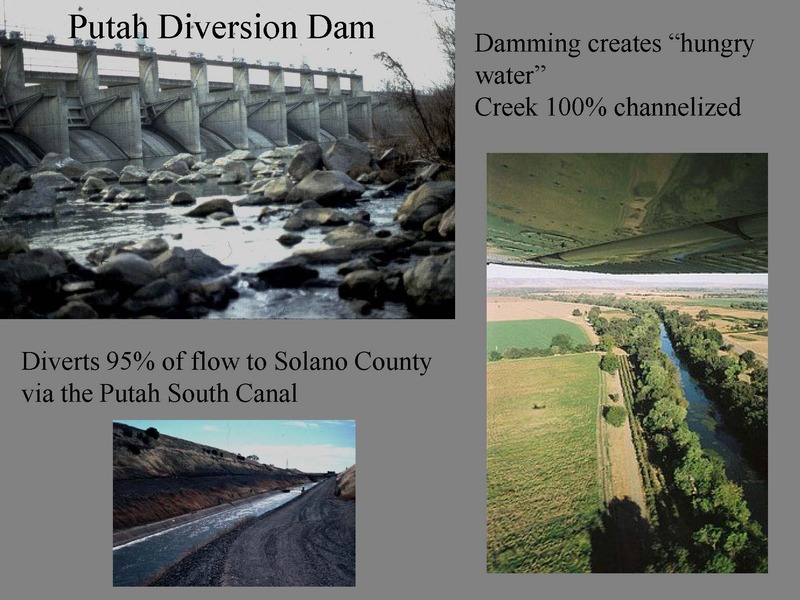 She presented a map of Putah Creek, and pointed out the location of Monticello Dam and the Putah Creek Diversion Dam, noting that about 90% of the creek’s water is diverted to Solano County at that point. 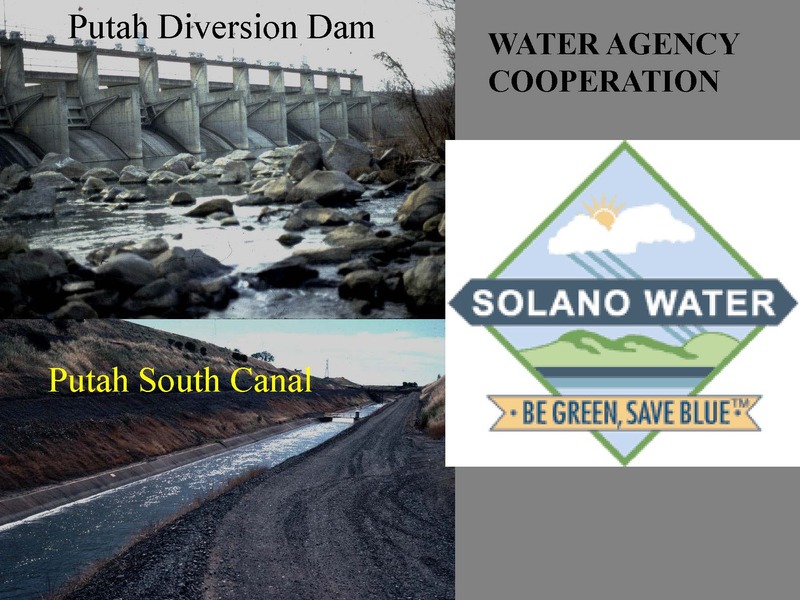 Further downstream, Pleasant Creek, a tributary to Putah Creek, is a source of fine sediment to the creek and creates water quality issues, and another tributary, Dry Creek, is a major source of coarse material. 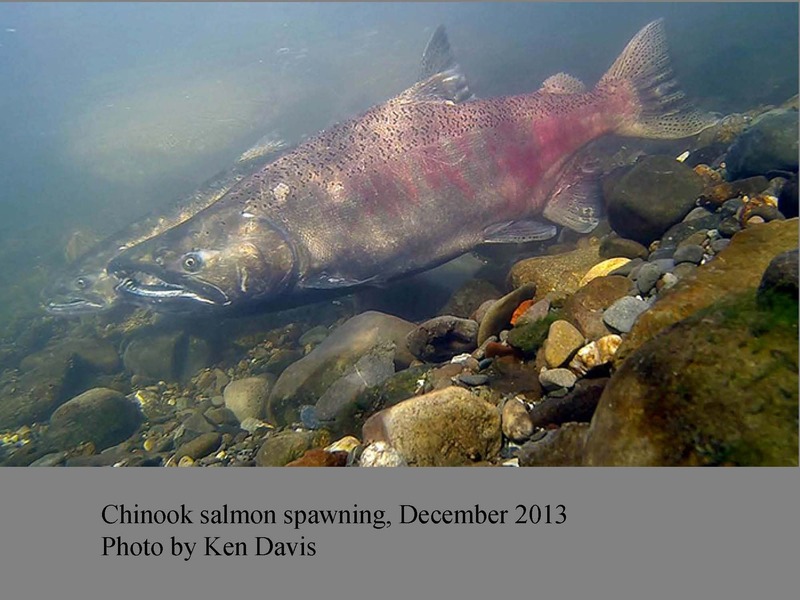 “This is very important for salmon spawning and for in-stream habitat, so there’s work being done to try to recruit more of this gravel and bring it into the Creek, because it is starved for sediment,” she said. 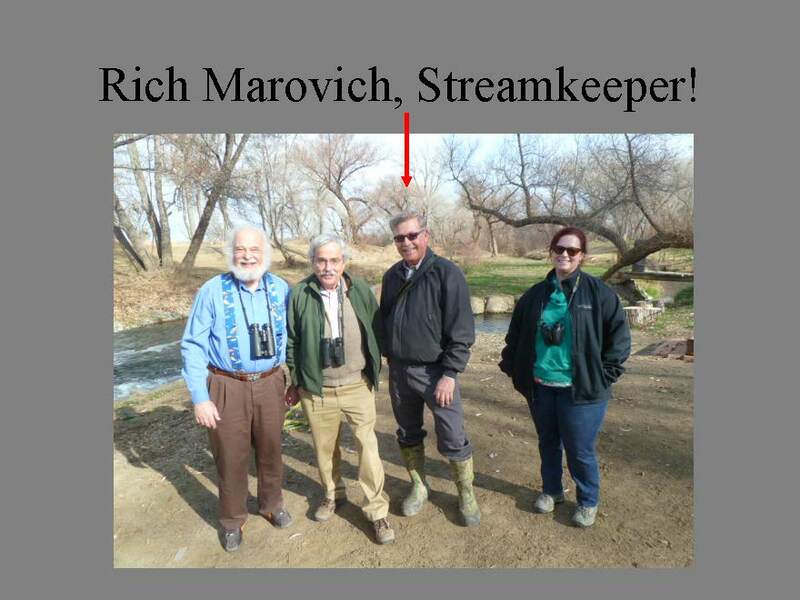 She noted the towns of Winters and Davis, pointing out where the creek was shunted into a new channel around the early 1900s. 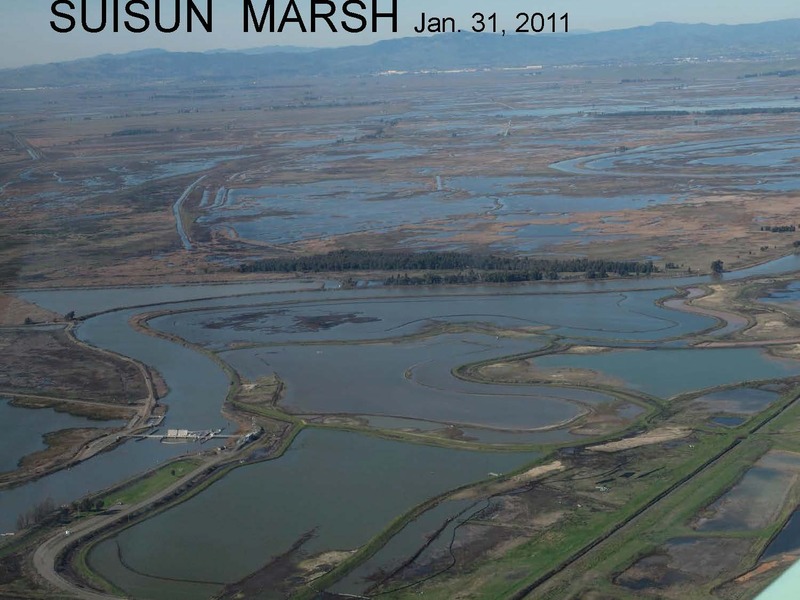 “It kept flooding the town, eventually they just shunted it south and made a new channel for it and run into the Yolo Bypass,” she said. 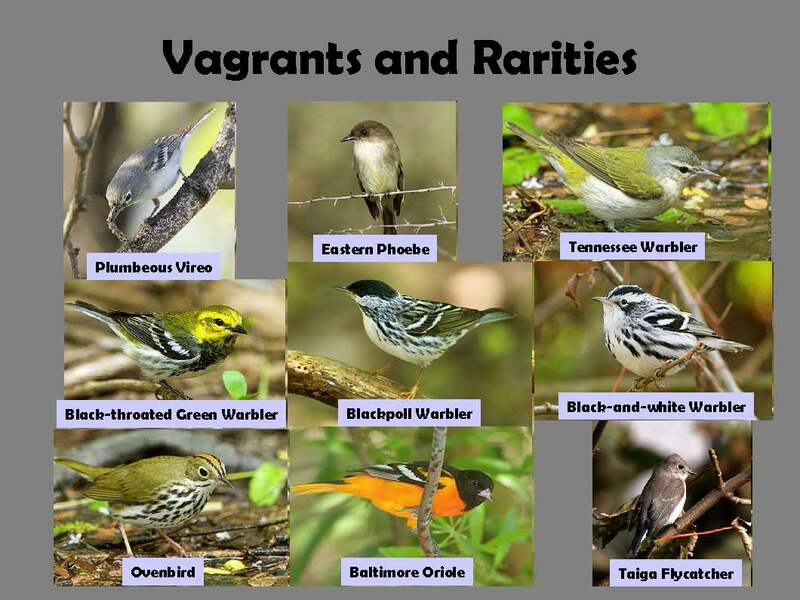 We have the most records for birds, Ms. Truan said. 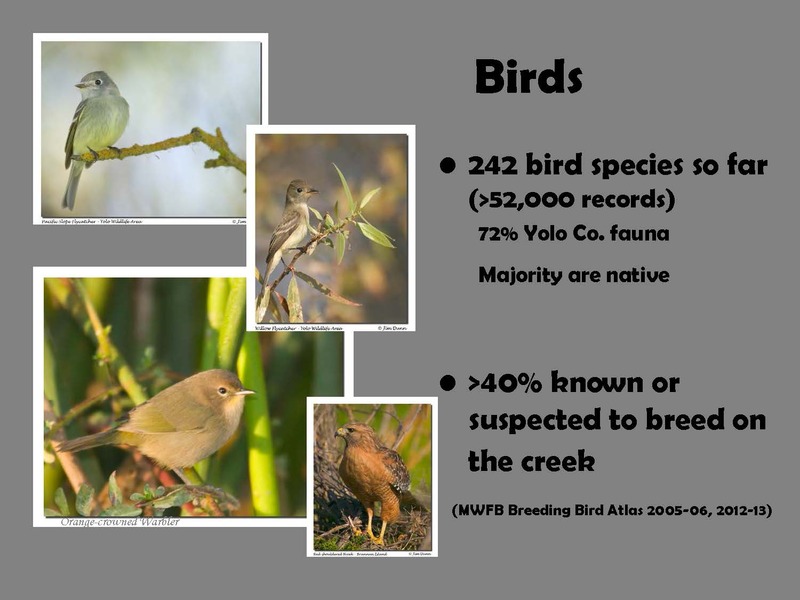 “52,000 records so far, 72% of the Yolo County fauna and about 40% known or suspected to breed on the Creek,” she said. 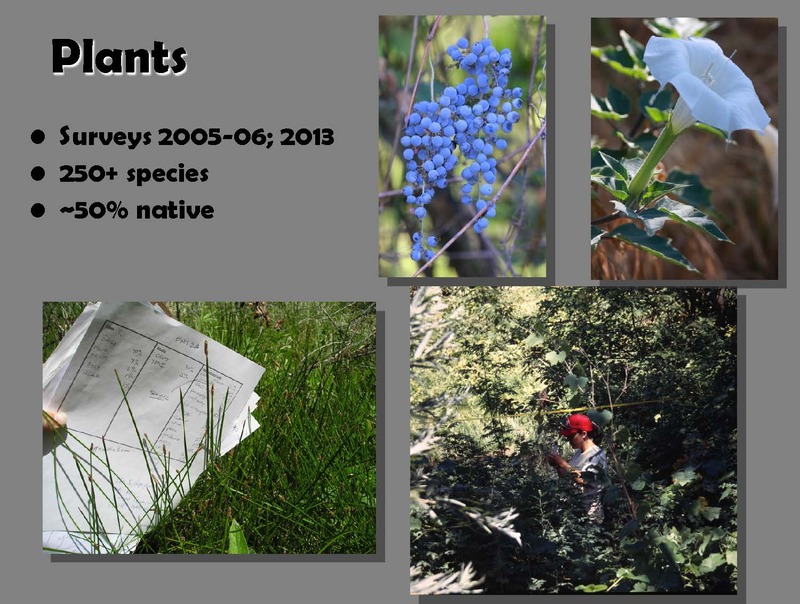 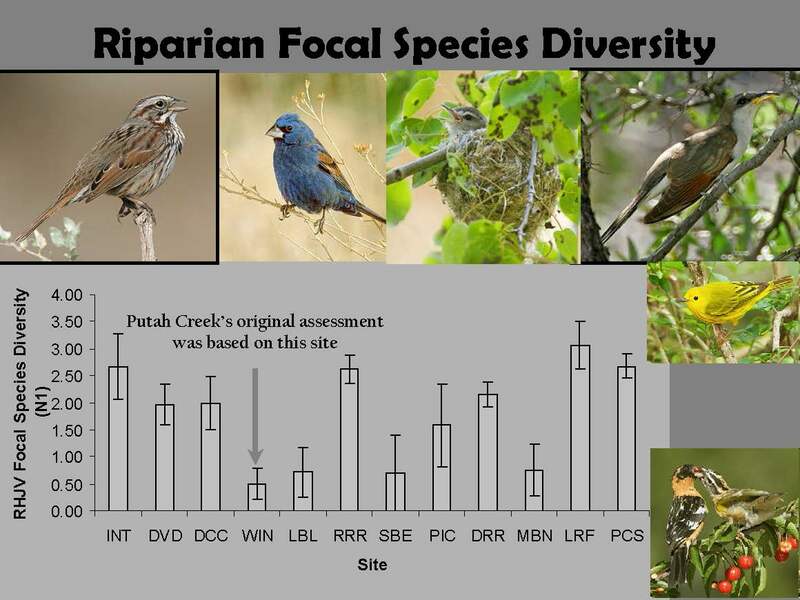 She noted that riparian focal species, considered indicators of riparian health, have been found on the Creek. 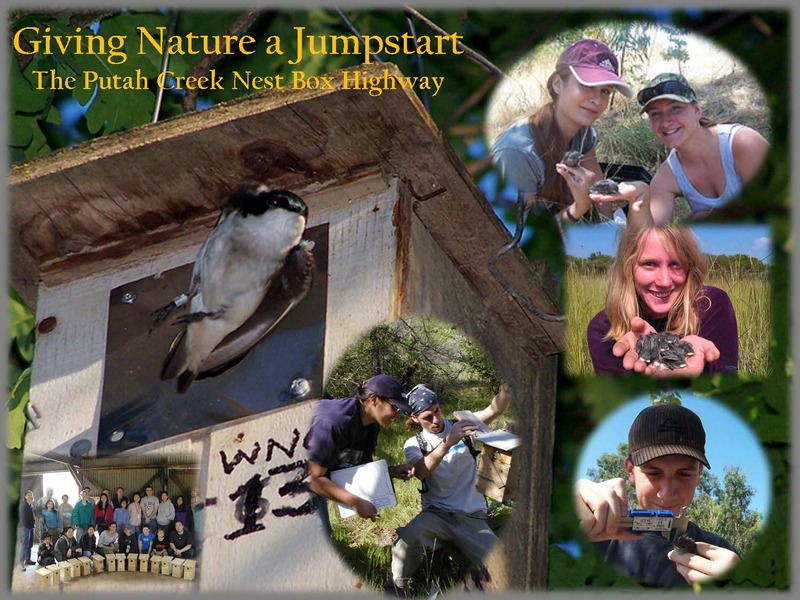 In 2000, we started a project called the Putah Creek Nestbox Highway, a project to integrate habitat restoration, help species and provide environmental education for the public, Ms. Truan said. 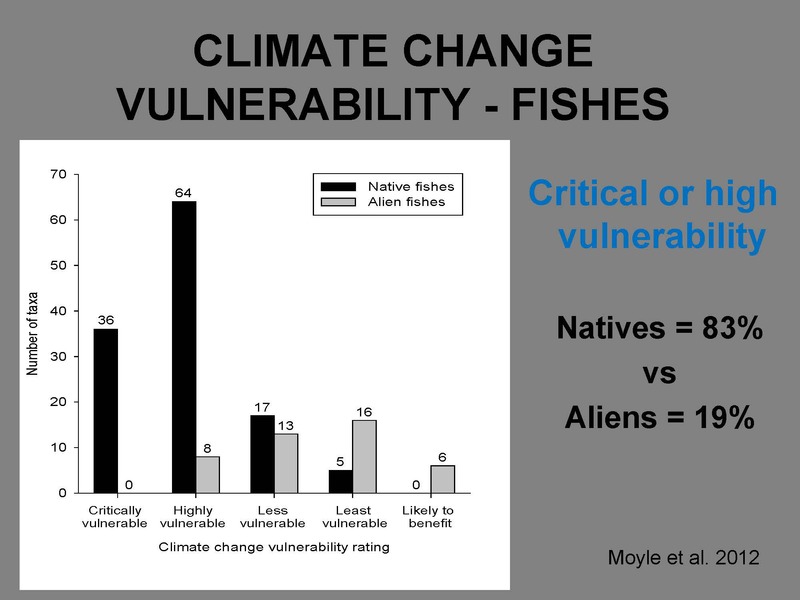 “You can manage the environment, but the aliens are still there, said Mr. Moyle. 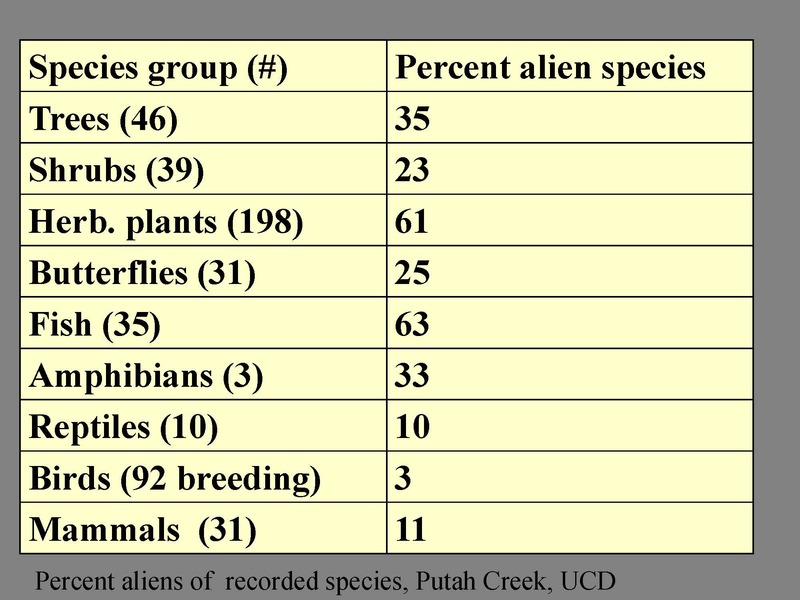 “They don’t go away – they just get suppressed, and in fact, they’re still abundant in many places. 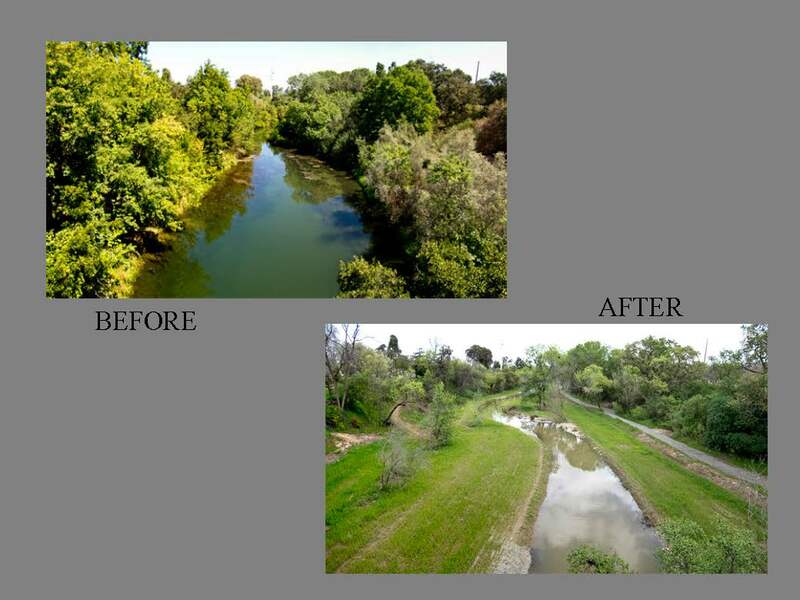 In the 1850s to 1950s, there was a lot of flooding from the Creek so the focus was on trying to make Putah Creek go away, so it was leveed and confined to a channel, he explained. 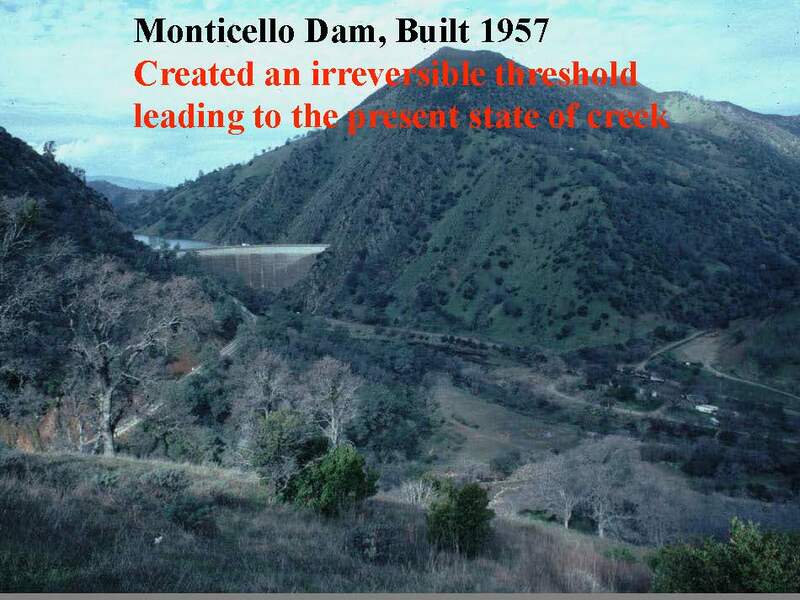 In 1957, Montiecllo Dam was built which totally changed the creek, and even the resource agencies wrote off the lower portion of the creek as not worth bothering with, he said. 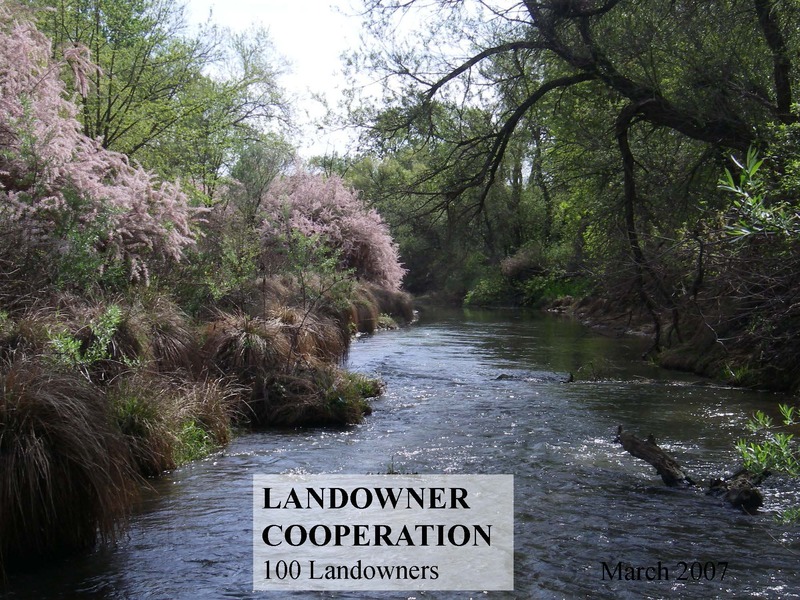 In 1986, the University of California stopped mining gravel out of the creek and declared it a riparian reserve. 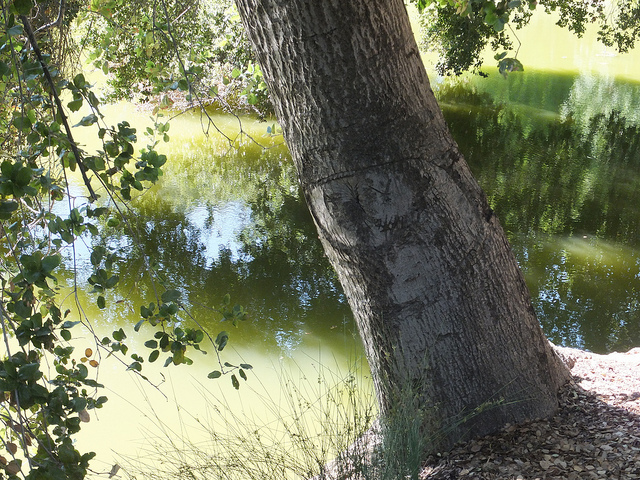 “It looked really awful but that’s where you start,” he said, noting that it came about because of student demands. 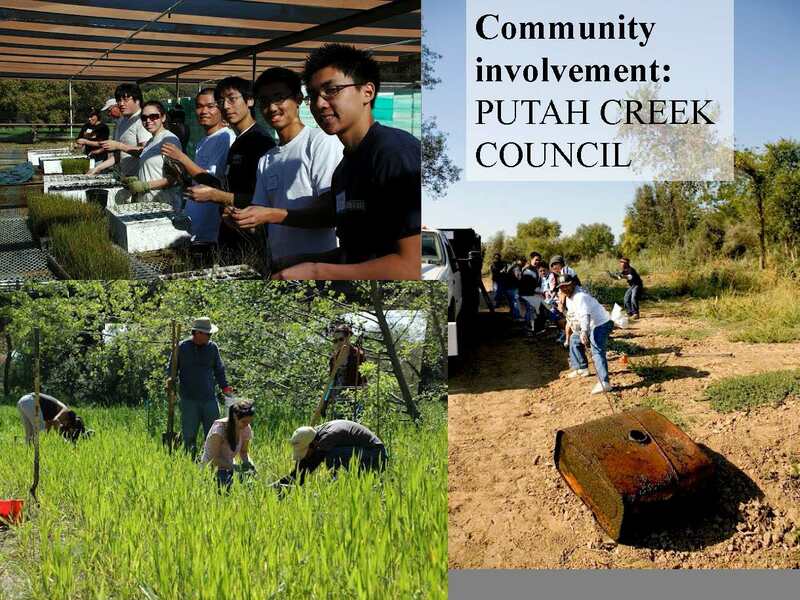 The Putah Creek Counsel was formed in 1988, an organization designed to pick up trash and to help the land owners take care of the land along the Creek, he said. 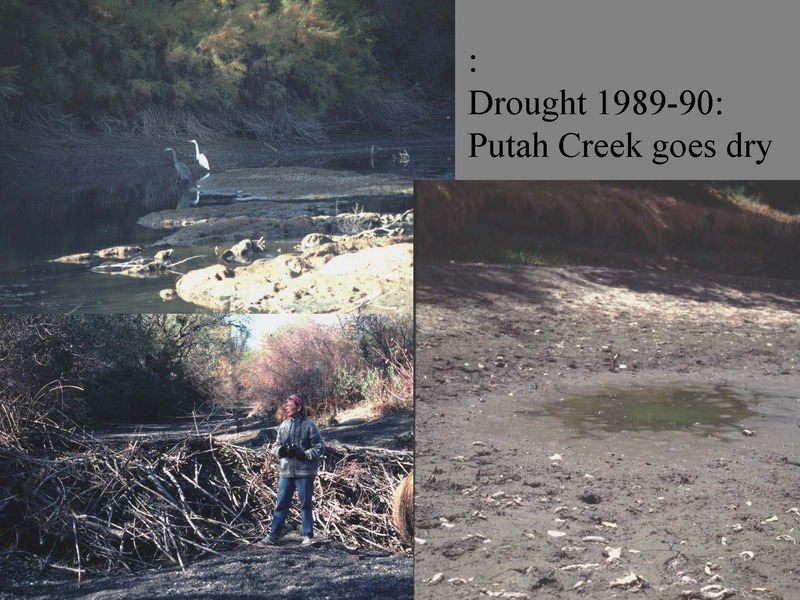 Then a drought, which dried up the creek at times, culminating in a 1996 lawsuit to restore the flows that was settled in 2000, he said, noting that it was the period from 1996 to 2000 that things really started to change. 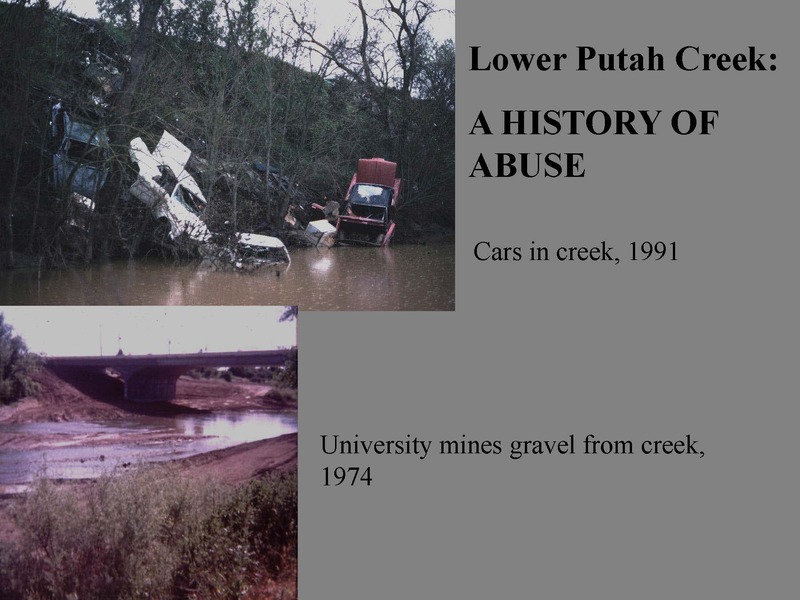 He then presented a series of historical pictures documenting the once-squalid conditions in the Creek. 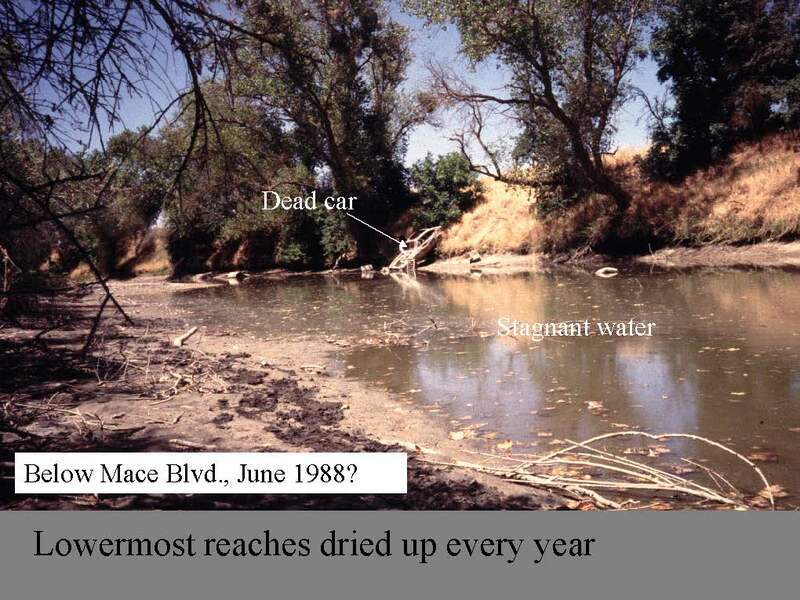 This is 1991, and this is the ‘Detroit Riprap’, the classic way of disposing old cars, he said. 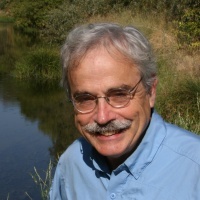 “You dump it, throw it in the streams, and stabilize the banks,” he said, noting that the university also mined gravel out of the Creek for a long time. 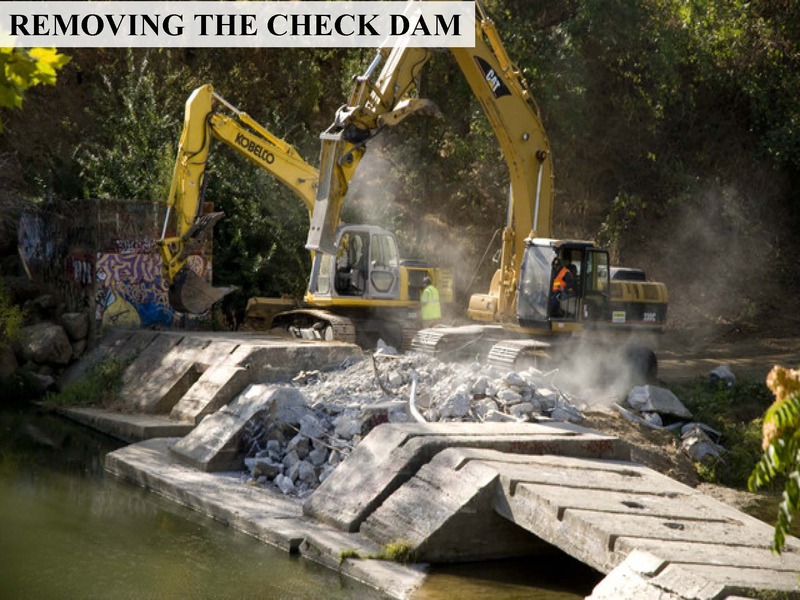 There were some old cement dams that had to be taken down because they were unsafe for the kids, so people decided to make it into an ecological park at the same time, he said. 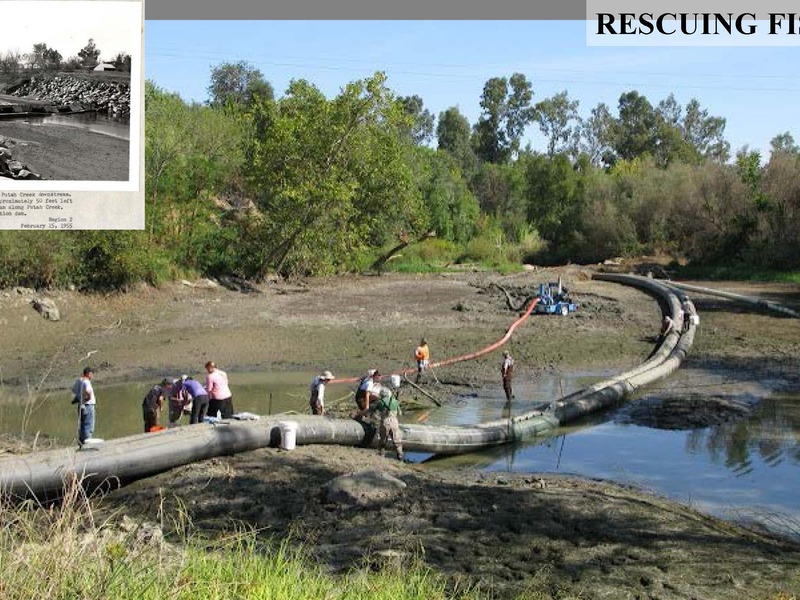 During construction, the creek had to be put into pipes, and the fish had to be rescued. 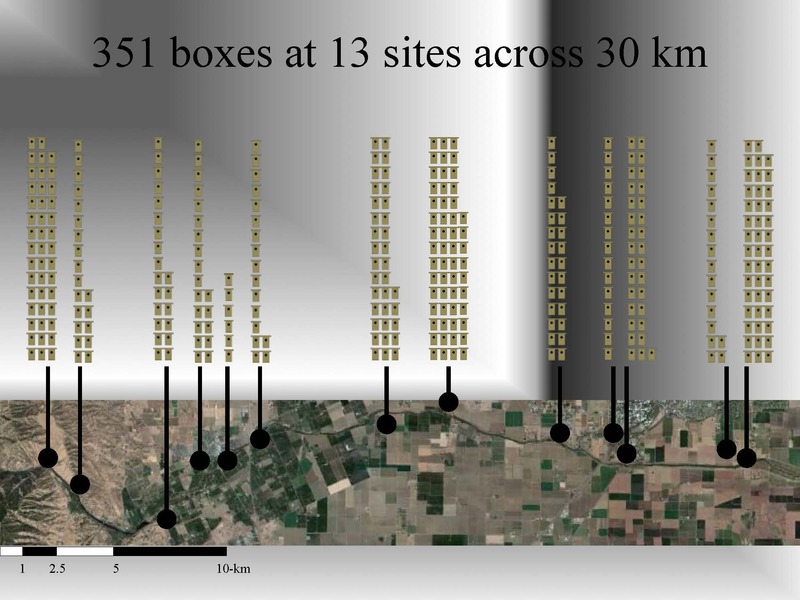 “So there is hope. 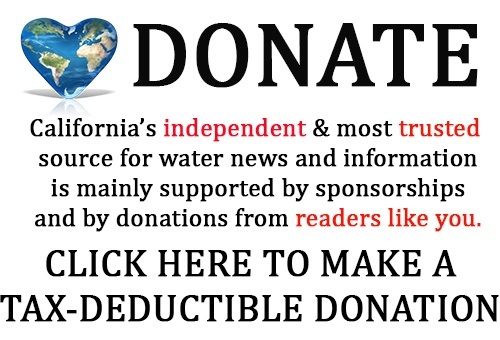 So, at this point, I’ve some conclusions, but Melanie, do you want to start with your conclusions?” Mr. Moyle said. 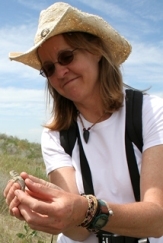 “The thing that strikes me most as an ecologist about this whole process and system is that species interactions are what drive evolution pretty much,” said Melanie Truan. 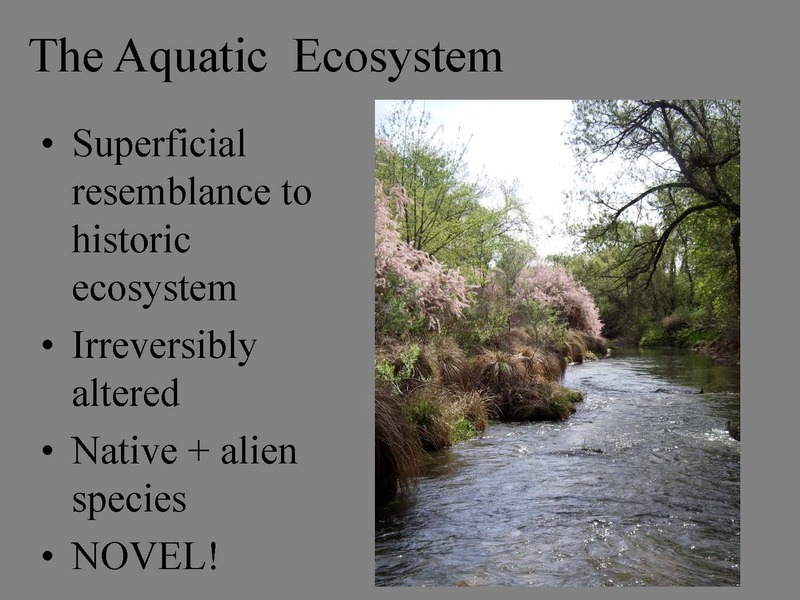 “And what we have here is a system in which we have brand new species interactions happening between invasive species, native species, and new combinations of species in a new environment and it makes one wonder what sorts of evolutionary processes are occurring or could occur in a system like this and what’s driving these sorts of changes. 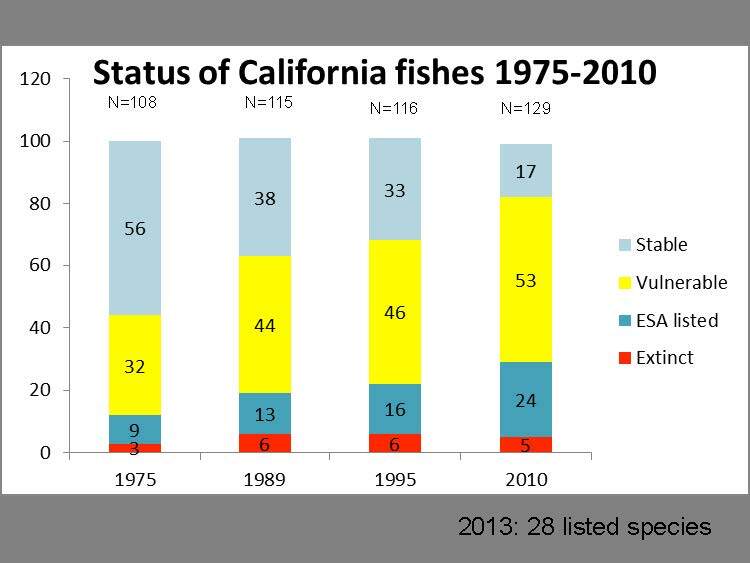 Maybe there’s rapid evolution happening here and not other places. 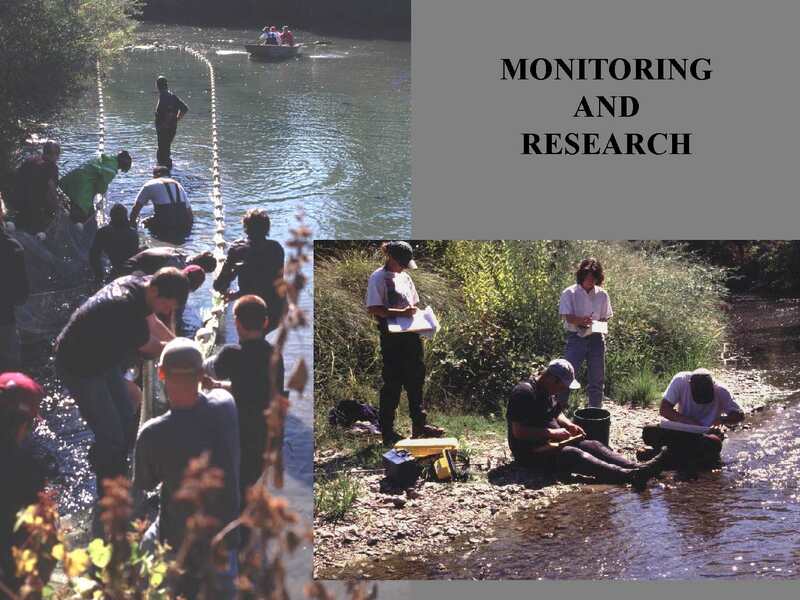 It seems like there’s a lot of opportunity for students and professors and researchers to apply some of these questions to the Creek and to take a look at what’s going on out there and use it as a springboard for research and as well as education,” and she noted that there are a lot of projects going on right now, such as an active working landscapes group looking at the agricultural matrix and how it interacts with the waterways, and connectivity between different habitat elements. 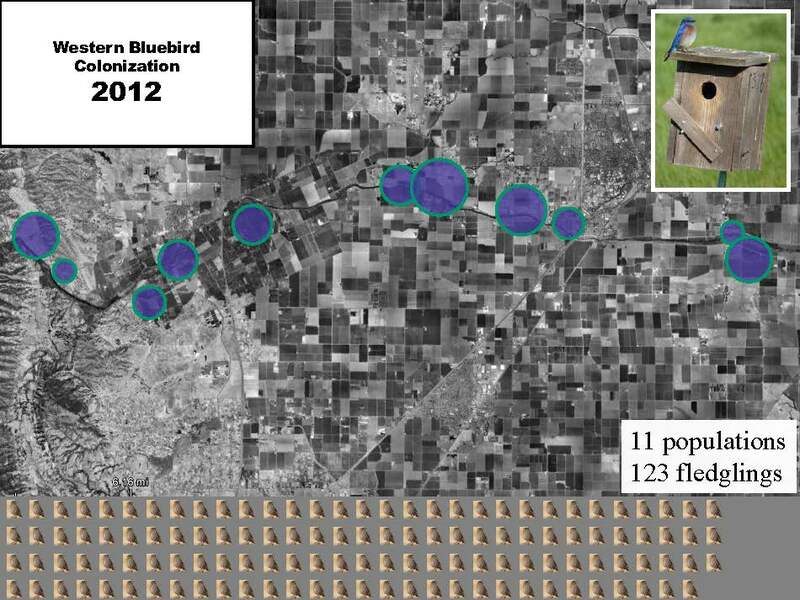 The floor was then opened for questions. 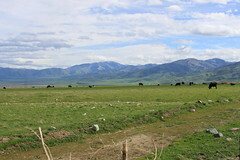 Putah Creek by flickr photographer Miwa. 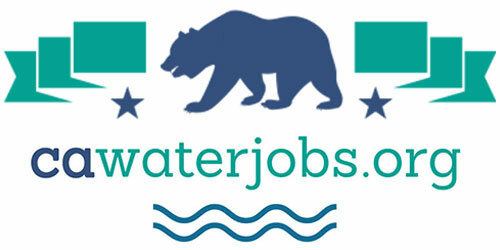 A participant asked if they thought the process would have gotten as far as it has without the lawsuit. 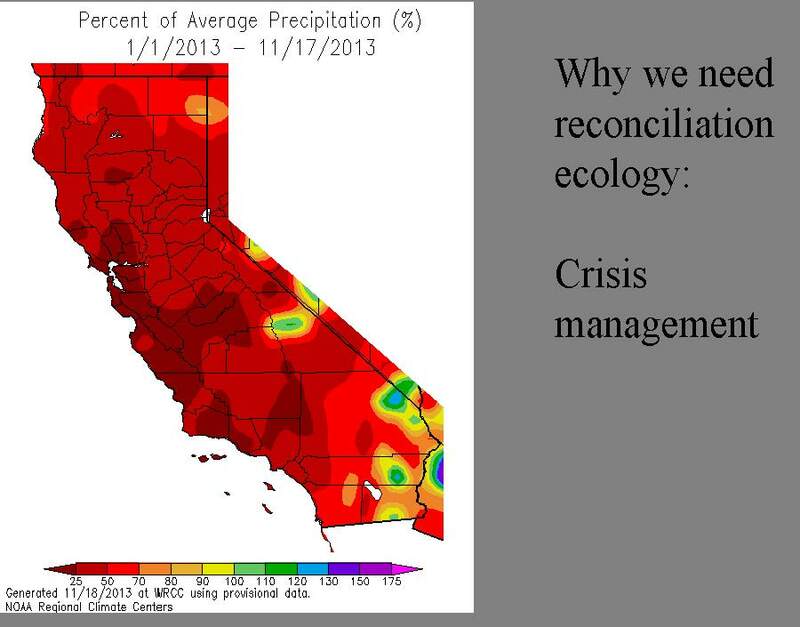 A participant asked how agriculture intersects with reconciliation ecology. 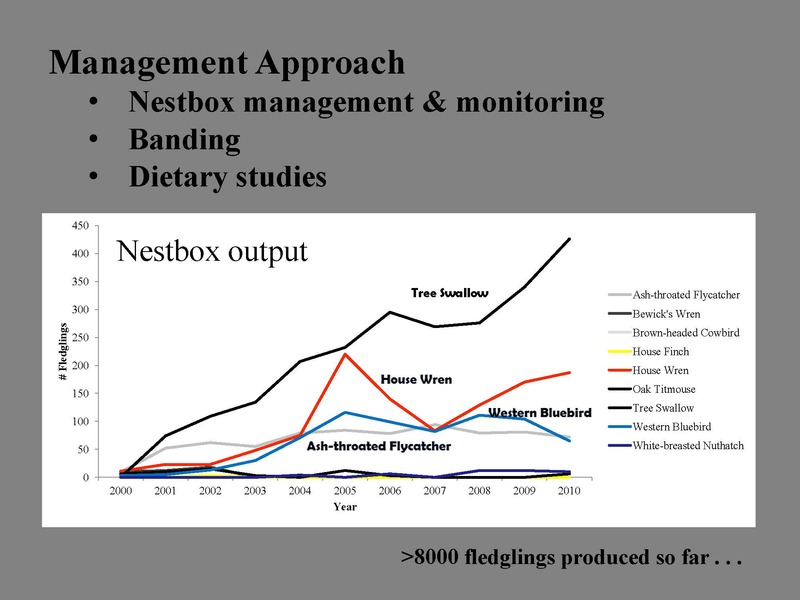 “Other than environmental, what other benefits or incentives did the farmers have to work with you in restoring or reconciling the ecosystem?” asked a participant. 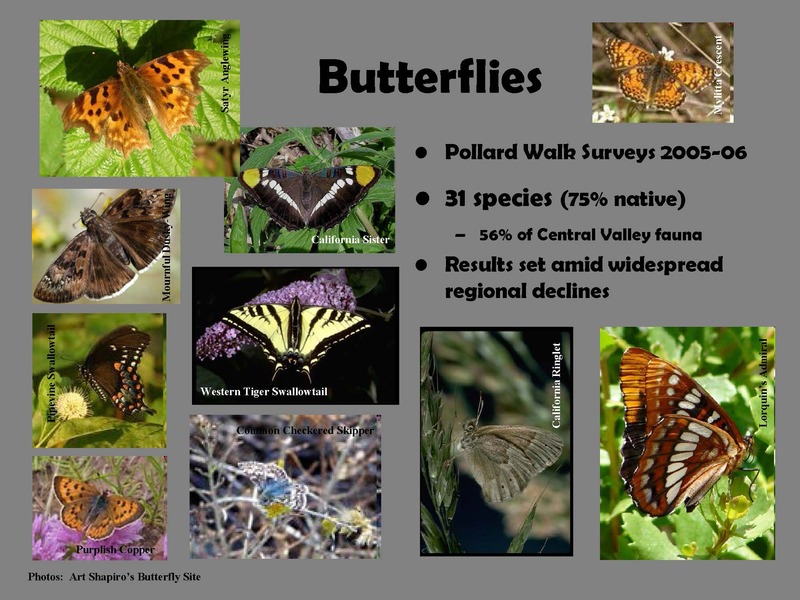 “I could say pollinators is one,” replied Peter Moyle. 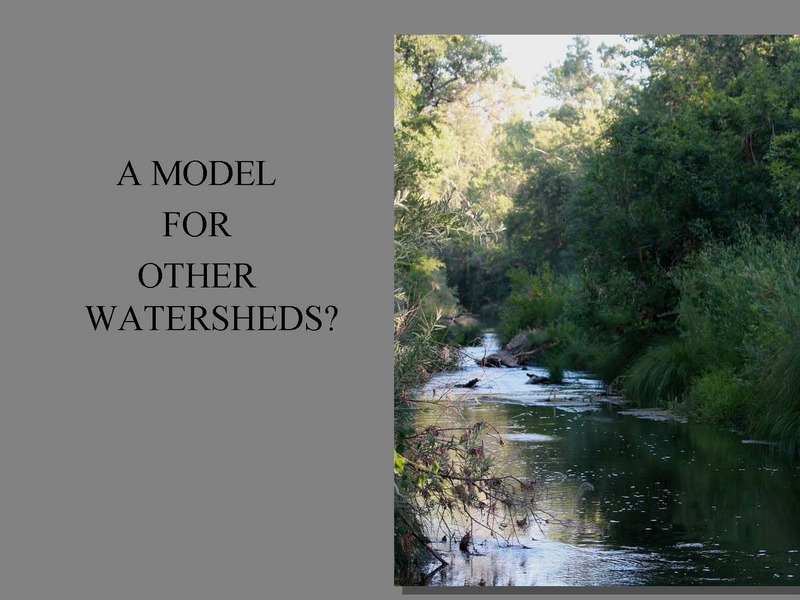 “Are you at all worried that there might be a source of perversion of reconciliation ecology in the name of deriving more ecosystem services from the anthropogenic view, instead of doing it for ecosystem function and biodiversity?” asked a participant. 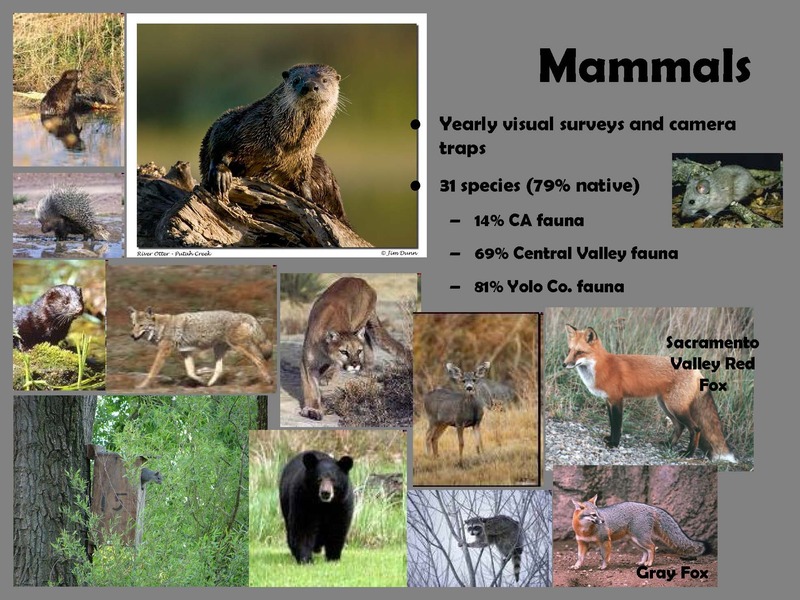 Click here to visit the Museum of Wildlife and Fish Biology online. 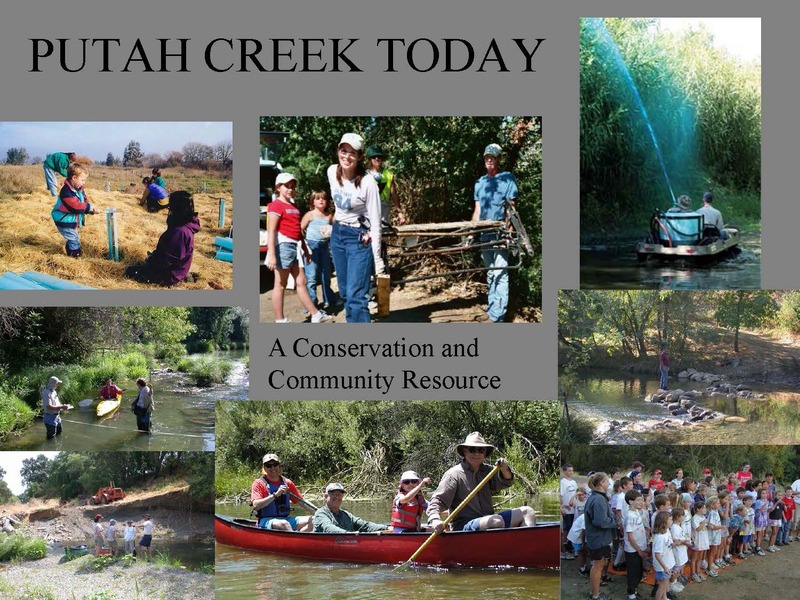 Click here to visit the Putah Creek Council’s website. 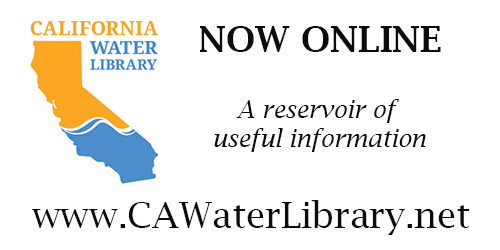 Click here for more speeches from the California Water Policy Seminar Series.